Featuring bulky alpaca wool yarn, alpaca silk knitting yarn, blue sky organic cotton yarn, and spud and Chloe Knitting yarn. Bulky Handspun Yarns made for us by the fabulous Ozark Mountain Handspun Company. A stunning assortment of mohair and wool bulky and funky unique knitting yarns from david gentsch. Looking for pure Mongolian Cashmere yarn? Look no more, jade sapphire has 6 ply cashmere, 2 ply cashmere lace yarn, handspun cashmere yarn and bulky cashmere yarn. For the best cashmere yarn under the sun, look at Jade. Known for the incredible softness of ther merino wool worsted yarn, malabrigo continues to amaze us with their beautiful color sense and their new fibers. This year, we added Arroyo, RIOS, Rasta Super Bulky Merino Wool and Aquarella, a thick and thin handspun like gruesa, and their silly merino too. We just can't get enough of maalabrigo! Tilli tomas eclectic and funky hand knitting yarns feature fibers from silk to seacell (thats kelp!). Try out her Magical Mystery Ball if you want yarn that is unique and different. It's a great bulky yarn to knit on larger needles. Her Rock Star Yarn is one of the most popular on planet earth, it's a yarn featuring beads and sequins and knits up quickly into luxury yarn projects. Looking for Bamboo? 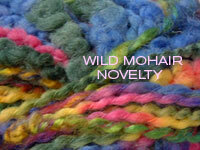 Mohair Yarn? Mohair Boucle? Look no further - Be Sweets Fabulous and tasty assortment of handspun and hand-dyed knitting yarns are just the ticket. From their beautiful hand -dyed bamboo yarn to the eclectic bead ball yarn, you will find something groovy in the way of yarn here! Famous for their incredible line of super bulky handspuns, included the amazing pixie dust yarn and gypsy garden yarn, Knitcollage introduced STARGAZER YARN this year, an aamazing hand spun silk yarn with brass sequins. Just lovely, it is super soft and drapey. We at fab have always prided ourselves on the incredible handspun yarns we've found from manilla to massapequa. This year, we've added several new handspun lines, including Pagewood farms and Knitcollage. Ozark Yarn Handspun is still one of our most popular lines, as well as the amazing handspun yarns from Malabrigo. Plymouth yarn is a staple in many knitters stashes- from their lovely Camel and Cashmere yarn to the softest angora yarn imaginable, Plymouth provides great yarns at very reasonable prices. Because thhey are machine made, and not handmade, we only carry a very select few of their yarns that seem extra special to us. Alpaca yarn is know for it's softness, it's beauty and its loft - alpaca is lightweight, but is a hollow core yarn, so it insulates beautifully. It's also great for people with wool sensitivity - often they can wear knitted garments out of alpaca where they couldnt, before. What is it about Mohair yarn? Something soft, beautiful and delicate - especially when it's one of our luxury mohair yarns containing absolutely NO synthetics - and made from the highest quality mohair fiber available. It makes our selection of extra special, because you will find our mohair to be not scratchy at all! One of the oldest, most adored fibers on the planet, we boast a selection of Silk Yarn from around the world. Artyarns Regal Silk, Tilli Tomas Pure and Simple, and our very own peau de soie show you the beauty of silk yarn at great prices. There is no doubt that some people just want organic next to their skin - or next to their babies skin - which is why we carry a selection of organic yarn that will give you choices from worsted cotton yarn to skinny cotton yarn. From Blue Sky and their organic worsted cotton, to Pakucho undyed fair trade cotton yarn, the organic yarns we carry will give you lots of choices! Chapelknitworks was established in 2004, as the home of our custom knit baby sweater company, fabsweaters.com. Since that time, we have gradually moved from designing, making and selling handknits to our yarn loving customers around the world, to just selling the yarn! Hence, fabulousyarn.com was born. We feature an incredible selection of luxury yarn - from alpaca to silk, mostly handspun, and many locally made or manufactured. 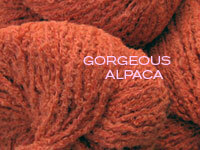 From malabrigo yarn to Artyarns, to Blue Sky Alpaca - you'll find it all here. If you are interested in Exotic, luxury yarns, please visit us either on the web, at www.fabulousyarn.co, or at our shop, Fabulous Yarn, located in upstate New York, in the small town of Tivoli, right near Red Hook, and Rhinbeck, home of the sheep and wool festival. If you come the the Sheep and Wool festival, make sure you visit us! Whatever you are looking for, you'll find it at Fabulous Yarn, the online store for Fiber Fanatics! We also support our knitting friends by sharing our free knitting patterns, available online at fabulousyarn.com. For special occasions: check out our handknit, handmade gift sweater sets, combos of our hat and baby sweater styles that will melt anybody's heart-they make great gifts for a baby shower, unique and amazing. Baby sweaters and great gifts for a spectacular showing at a friends baby shower are hard to find....but you've found the best and most unique baby, toddler and kids sweaters on the internet! is owned by chapelknitworks handknits.